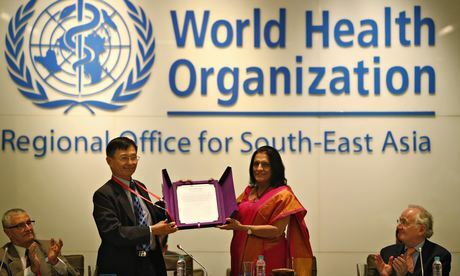 On Thursday, March 27, as noted in a CNN article, "India and Southeast Asia were officially certified by the World Health Organization as being polio-free -- a momentous achievement for global public health and the worldwide effort to eradicate polio." The article, written interestingly by the Indian actress, Freida Pinto, who starred in the movie, "Slum Dog Millionaire" also relates a bit of history that in the mid-1980s, 150,000 to 200,000 people were afflicted by polio, and, "even as recently as 2009, was home to nearly half the world's new polio cases." In a Teatree blogpost of February 12, 2012, we saw where India at the time had been declared free of wild polio virus for one year by the World Health Organization (WHO). For today's post, apparently the WHO needs to see three years where no new cases have been reported, and that is the case. The article continues, "Great achievements don't just happen; they require the great efforts of many. The polio eradication movement, started in 1988, was a joint effort between the Indian government; WHO; Rotary International; the Bill and Melinda Gates Foundation; UNICEF and various other NGOs; the United States, Canada, the United Kingdom and about 2 million workers who vaccinated nearly 170 million throughout the country to finally wipe out the disease. Truly, this worldwide effort should serve as a reminder that when the global community bands together to solve an issue, great things can be achieved. And today should serve as a call to not simply continue the efforts but to exponentially increase them." "There are only three countries where polio is still endemic: Pakistan, Afghanistan and Nigeria. However, isolated outbreaks in the Horn of Africa and war-torn Syria emerged as causes for concern in 2013, and vaccination workers in Pakistan are still being killed by the Taliban. "Until polio is globally eradicated, all countries are at risk, and the region's polio-free status remains fragile," WHO's regional director, Poonam Khetrapal Singh cautioned." India's story is remarkable all alone as has been noted, it was just 5 years ago the site of half of all the world's polio cases. A truly worthwhile effort which now must concentrate on the violent situation in Pakistan & Afghanistan, the chaotic and violent situation in Nigeria, and the anarchic situations in Somalia and Syria. Here's a link to a really fascinating gif of the eradication of polio around the world. India stays red forever and then suddenly 2014 - completely clear. Pretty amazing!